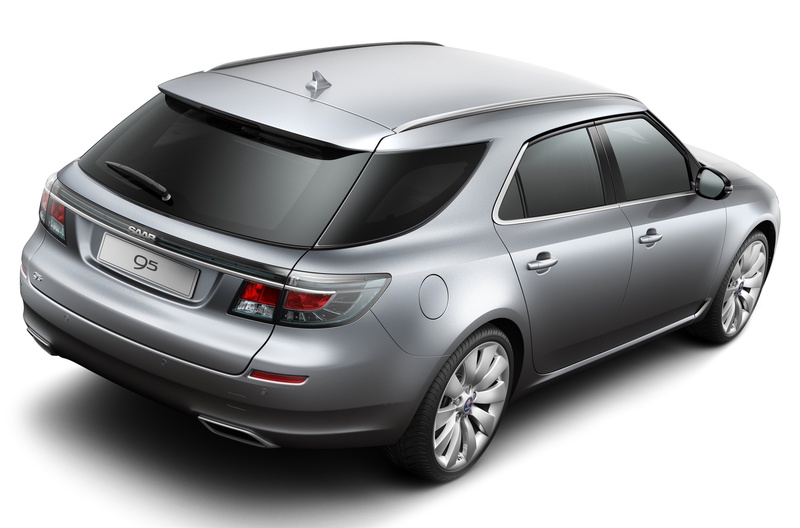 Designed in parallel with the saloon, the 9-5 SportWagon shares the same bold frontal styling and adds a swept, ‘wraparound’ rear window graphic. 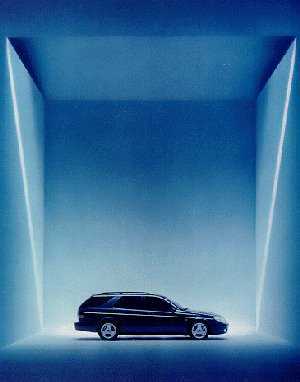 This echoes the 9-5’s signature frontal theme and gives the SportWagon its own distinctive identity. 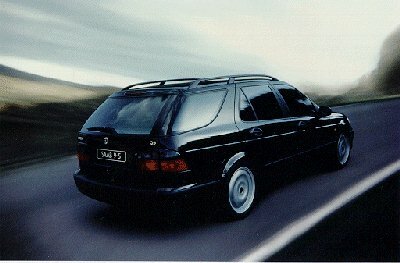 The dramatic, sweeping roof-line is extended by a deep rear spoiler integrated into the top of the tailgate. Ultra-slim roof rails that blend into the car’s svelte silhoutte are fitted as standard. 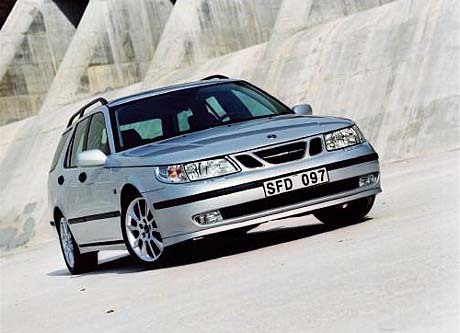 Signature Saab themes, such as the strong C-pillar with its hockey stick extension of the belt-line, are combined with a prominent rear shoulder contour to give the SportWagon a muscular and dynamic stance. The tailgate is raked forward to underline the car’s dynamic character. It features a full-width ‘ice-block’ rear light bar which wraps into light units at either side, continuing a new signature Saab styling theme first seen on the 9-5 saloon and 9-4X crossover. The deep cargo deck is fully carpeted and optimized for space and ease-of-use. The 60/40 split rear seatbacks fold down almost completely flat without having to reposition the seat squab or remove the head restraints. Careful attention to soundproofing in the rear bodywork attenuates noise, vibration and resonance so that occupants enjoy a level of interior refinement similar to that of the saloon. An optional, U-shaped track around the outside of the floor provides flexible space configuration. As in the 9-5 saloon, it carries an adaptable, telescopic dividing rail which allows the cargo deck to be split as required so that different sized items can be separated and kept in place. The floor, with a signature Saab aircraft-shaped handle, folds back in steps to access under-floor storage, with a sub-floor 65 mm below the main floor height – ideal for the separate stowage of flat or small items. A pull-out support arm can be slotted in place to keep the folded floor in a fixed position. This provides further support for items stored in the under-floor recess, as a flexible alternative to using the entire cargo deck. The underside of the floor has two fittings for flat stowage of the U-rail divider. They also carry hooks that can be used to organize bags, for example. A waterproof plastic liner, available as an option, can be dropped into the recess to provide a separate wet storage area for sports equipment, outdoor clothing or muddy boots. For additional convenience, the tailgate is available with a remotely-controlled, electric power operation. It can be fully opened and closed via a rotary knob in the driver’s door or a button on the car’s key fob. A touch pad on the outside of the tailgate, above the number plate, also triggers powered opening and closing. A programmable mode can be used to raise the tailgate to a lower position if there is restricted clearance overhead, such as inside a garage. The opening height is pre-set via the rotary knob, which can also disable the powered function. For ease of loading, the tailgate opens down to bumper level with a lift-over height of only 648 mm. The cargo deck floor is also flush with the tailgate opening to facilitate sliding heavy loads inside. A down-lighter in the tailgate and small sidewall lights provide excellent illumination of the load space at night. A retracting cargo cover can also be slotted into lugs in the sidewalls immediately behind the rear seats. It keeps items out of sight and includes a convenient one-touch action which allows the ends of the locating bar to slide up channels on the inside of the D-pillars for convenient access to the cargo deck.